Boy did we luck out. California is notorious for being one of the most wine rich regions in the world, not to mention the U.S. From Temecula to Napa and Amador to Paso Robles, we’ve got an abundane of righteous wine. Of course, when people think California wine, they automatically associate Napa and Sonoma. Don’t get me wrong, I have had some fabulous wine in Napa and Sonoma. The bubbly at Domaine Carneros? Fab. The deep reds at Gundlach Bundschu? Perfection. But come on, we Californians like to live on the edge, we like to go outside the norm and find the fabulous in the unknown. To this end, I bring you to Lodi and Clarksburg. Just thirty minutes outside of Sacramento proper, Lodi might not have the “Wow!” inspiring rolling hills of Napa, but it’s Zin’s pack a tasty punch. And Clarksburg… I mean, can you beat delicious local wine just ten minutes from midtown? I think not. To get to Lodi, just head south on The Five until you hit Highway 12. Literally thirty minutes outside of town. Take a left at Highway 12 and you will be shocked to find just how close the first, and I would dare say best, winery is in Lodi: Michael David. One of the added bonuses at Michael David is that they are also a working farm, selling uber fresh produce and featuring an in-house restaurant. Oh, and you can’t miss out on the farm life going on out back. Baby chickens, furry rabbits, ducks and the house turkey that rules the roost. Take a tour in the flower garden and enjoy a bottle of Petit Petite while playing a game of bocce ball… It is simply divine. Next on your trip through Lodi, you have to stop at Lucas. A certified organic and solar-powered winery, the owner has travelled the world has an incredible display of soil, sand and shells from the beaches around the world that he’s surfed and the vineyards he has visited. Known for their ZinStar, they also have a great Chardonnay for those looking for something on the lighter side. As a bonus, they are usually quick to offer up a tour of the vineyard and a great 411 about the finer points of growing great grapes. 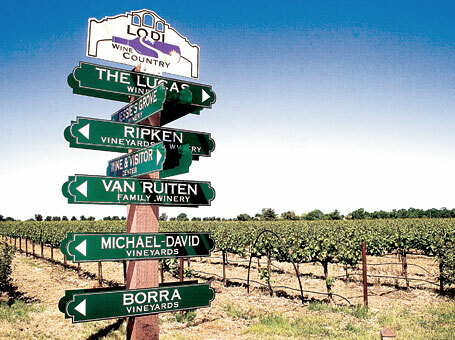 Other high points in the Highway 12 area of Lodi include Jessie’s Grove Winery and Van Ruiten Winery, both worthy stops on you Lodi wine tour. My favorite Lodi trip always includes a stop in Clarksburg, just ten minutes from Sac, on your way home along the 5, exiting at Pocket Road. Clarksburg is a winner: One location, eight local wineries. Yes, you read that right. Clarksburg features an old favoritewine spot, The Sugar Mill. Originally a working sugar mill opened in 1935, the huge indoor facility now houses some killer local wines. My new favorite is the recently opened Elevation Ten. Full disclosure here: I know the owners. I’ve even volunteered to help out at a weekend event held at the winery for Valentine’s Day. That is when I got first-hand experience with the great staff of Elevation 10; it was one of the most fun days I’ve had in a long time. On their opening night I first enjoyed a taste of their Proprietor’s Blend; a scrumptious mix of Petite Verdot and Cabernet Franc. This is a wine you save for special occasions because it is simply too good to drink on any old night. Another winner is Todd Taylor. They feature a great list of bold reds, including Cabernet Sauvignon, Cab Franc, Primitivo, Tempranillo… and the list goes on. On a couple trips to Todd Taylor, we have been lucky enough to spend time with the winemaker over some barrel tasting, which was superb. If you happen to see him in there, try and catch his eye to see if he’s offering any of those barrel tastes – yum. Since you’re already enjoying the Sugar Mill, it would be a shame to miss all the other fabulous wineries a mere hop, skip and a jump away. Do check out Three Wine Company, Merlo Family Vineyards and Rendez-vous, Heringer Estates, Clarksburg Wine Company and the Carvalho Family Wines. Now that you’ve gotten the primer on the untapped wine resources at your fingertips, I say take a day and enjoy! Make sure you have a designated driver, of course, and have a great time exploring the wine regions on the brink of becoming too crowded to enjoy. You’ll be glad you did! Love the article! Bogle is also a fabulous stop!